Paul McGinley is still ready to scrap it out for victory. 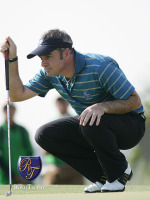 Photo Eoin Clarke/Golffile 2011Paul McGinley is praying his career doesn’t go “wham-bam” as quickly as his left knee. The Dubliner, 44, tees it up in the BMW PGA this week knowing that he must go under the knife for the eighth time at the end of the season. He’s crashed to 560th in the world from a career high of 18th in 2005 but with power out of the equation at fast-running Wentworth he believes he can still have a say at the top level. Smiling, he added: “I don’t know if golf is still keen on me playing and my knee is giving me problems. But I’m still keen on playing it. I still really enjoy it. “I’ve had a very slow start to the year, which has been very disappointing. But it’s a long year and I’m long enough playing to know it can pick up very quickly. McGinley knows he must remain competitive if he is to become the first Irishman to captain a Ryder Cup team at Gleneagles in 2014. He’s playing on a one-year special exemption thanks to his place in the Top 40 career earners on the European Tour. However, his world ranking means that he is only 11th reserve for the International Final Qualifying event for the Open at Sunningdale on June 6. The emergence of the power game has seen him fall way behind the competition in recent years, yet he still reckons he can add to his haul of €10.5m in on course earnings in this week’s BMW PGA as the big-hitters are kept under control. Paul McGinleyin action on the final day of the Open de Andalucia. (Photo Eoin Clarke/Golffile 2011)He said: “There’s no doubt the game has moved on. It’s no longer the game that was around five or six years ago. But that’s the way the game evolves and I’ve got to move with it. Of course I still feel competitive. I still feel there’s plenty in there. “It’s interesting when you get a golf course that doesn’t reward the wham-bam kind of player, how the older player seems to come through. At Sawgrass, you had Choi, who’s been around a long time and has been a very steady player. David Toms, whose been very quiet like me for a number of years and, all of a sudden, he rears up again. Paul Goydos. “The quality and style of golf courses we play nowadays very much dictate success. A lot of the courses we play are not like TPC or Wentworth. That course where Darren won (two weeks ago), Pula in Majorca, was a wonderful test of golf. “It was a short golf course, par 70, but it was brick hard. It was all about controlling the ball and hitting it on the fairway so you could then spin it off the fairway and into the green. “As you all know, Darren is a wonderful controller of the ball so it’s now surprise he won. Even me last week (Mallorca), I played really well. If I’d have putted half decent I’d have been right up there. I putted not just bad but abysmally. “Yet I loved the golf course and the test we faced last week. That golf course really suited me and that’s what was most disappointing about missing the cut – the course was right up my street. “Unfortunately, only five or 10 per cent of the courses we play on Tour nowadays are like that. Most of them have big, wide fairways like the London Club, where we played the European Open a few years ago. Wentworth will be hard and fast after a recent drought and that gives McGinley some chance of contending. “You look at Simon Khan winning here last year. Anders Hansen has won around here twice before and he’s a very, very, very steady ball-control kind of golfer. Then if you go to the big, wide-open courses, you get a different kind of golfer. McGinley is already looking to the future with a string of business ventures on the boil. McGinley said: “In these economic times we’re trying to save money for everybody. Every golfer who’s going away on holiday can gain from the niche that we see in the market. “It’s a lifestyle change we are trying to make. We’re trying to get people, when they go on holiday, to think of renting clubs instead of bringing their own. “We’re trying to take advantage of what’s going on out there and provide a service. Obviously we want to make money on the back of that but part of our service is we don’t rip people off. Paul McGinley crashed to a car-wreck third round performance at windy Wentworth to see his hopes of becoming the first Irish winner of the BMW PGA Championship for 50 years career off track at windy Wentworth. Padraig Harrington is urging Paul McGinley to look on the bright side after his Wentworth meltdown last week. Paul McGinley has often dipped into boxing parlance to describe his golfing battles over the course of a 17-year professional career. But like a prize-fighter who has suffered a humiliating defeat, the “shattered” Dubliner confessed that his third round 79 was a massive “body blow” to his chances of becoming the first Irishman for 50 years to lift the prestigious BMW PGA Championship title at Wentworth today.